It would be easy to start by saying “Toronto, we have a problem,” but surely the powers-that-be in the NHL know they have big trouble in the goalie crease. Perhaps even recent talk of it earned the Florida Panthers two points and cost the Detroit Red Wings at least one on Saturday. That’s right, we’re talking goaltender interference here. And while cheap blows and head shots leading to screwy disciplinary issues continue to plague the league, goalie interference (GI) is an altogether different animal. It’s a predator colored in gray and patterned in confusion. I’m sure the Red Wings would second that. After yet another controversial moment in the blue paint in the final 10 seconds led to a thrilling 3-2 Florida win in regulation, I had the choice of heading to either dressing room – the one of the victorious Cats or angry Wings. The Cats’ room would have been a breeze, an easy choice as the Panthers surely celebrated by saying all the right words. “Well-earned win,” “greasy goal” and “build on the momentum” were likely going to be floated around the room. But Detroit? That promised to be a little more bombastic – stewing and emotional, perhaps even R-rated (which rarely occurs). If nothing else, they weren’t going to give me the status quo quote. I’ve never been a fan of players saying the expected, the borderline cliché quote with a feel-good touch to it. Rather, I’ll take the off-the-cuff, upset, brutally honest remark of a player operating outside his comfort zone any day of the week, especially on a Saturday night in front of a great house with crucial points on the line against a divisional rival. So naturally I made the hard left turn off the elevator that sent me to Motown. To say the Red Wings were upset is about like noticing the Panthers couldn’t come close to hitting the net in the first 30 minutes. Really, those were some of the most open looks I’ve seen for a Florida shooter in a long time. Yep, these Wings were hot, fiery and spicier than anything ordered up the following day for the Super Bowl, and while profanity-free, all three players and coach Jeff Blashill spoke their piece on how the refs got it all wrong at the game’s end. Captain Henrik Zetterberg, a fine spokesman for Detroit, cut right to the chase. “Yeah, I do,” Zetterberg responded when asked if he disagreed with the decision. “The inconsistency in this league right now – if it’s the refs, the guys in Toronto, the suspensions, the fines – it’s hard for us as players to know what rules we’re playing under. Not yesterday, but maybe the week before the All-Star Weekend. The league discussed GI at length in Tampa during its midseason break. The Detroit side felt that the tendency before the break was to wave off goals due to the slightest contact with the netminder; however, following the exhibition in Tampa the Wings said they didn’t know what to expect from night to night and that all bets were off after Jonathan Huberdeau made contact with Petr Mrazek. “It shocks me that they call that a goal,” said Detroit forward Justin Abdelkader, who to his credit talked about the play for over six minutes. “Everyone around the league – players-wise, coaches, general managers – don’t know what’s a goal and what’s not with goaltender interference. “There’s such a gray area. It’s just amazing with contact like that in the crease, (Huberdeau’s) foot’s in the crease, that they call that a goal…That was an easy one, I thought…If the goalie can’t make the save because of contact, it’s got to be no-goal. Abdelkader said he thought “it was an easy call,” which led to Detroit’s frustration. If it was so easy, then why was the goal confirmed so quickly? I then asked Abdelkader what the remedy was. “I don’t know if it can be corrected in the short term before the season’s over, but it’s something for sure through our (players’ association), the players and the league to make sure that we make it as black-and-white as possible,” he said. Last season, Florida had a much more egregiously bad call go against them when the officials ruled Nick Bjugstad was in the crease and interfered with Detroit’s Jared Coreau, despite Bjugstad being pushed into the crease and making no contact with the backstop. The Panthers saw their 4-1 lead trimmed by a goal on the disallowance then lost in a shootout. From my standpoint, Saturday’s game ended as it should. Huberdeau did appear to make contact with Mrazek, who was much calmer in describing the play to the media than he was when the call was confirmed as a good goal, sinking Detroit’s hopes of getting four points in two nights. But Mike Green leaning into Huberdeau was the first contact on the play, and it created a domino effect. Plus, Mrazek may have oversold the contact a bit. The league wants more scoring, but these controversial calls aren’t the way to go about it. If a player gets an inch or two into the crease with no punishment, they’ll take a few more inches, then both skates, then goalies are being pummeled. These situations escalate in proportion to what players can get away with. The NHL needs to address this situation now, not in the summer. Make a quick fix, play it that way through June and tinker with it in the summer if necessary. At the beginning of the movie The Grey, Liam Neeson plays a marksman who is hired to kill wolves around an oil drilling site. Neeson kills them daily, using skilled precision to dispose of the threat they pose to other workers. The NHL has its own dangerous gray animal prowling at its 31 hockey arenas, but the threat is inside the cold rinks, not outside lurking in the wilderness like in the flick. The best bet for the league would be to hurry up and kill this gray beast before it stalks a steely path all the way to the postseason. Okay, so there are two weeks left in the season, the Florida Panthers are vying for the final wildcard spot in the Eastern Conference, Dan Ellis has just backstopped the biggest win of the year on the road against another playoff contender, and coach Gerard Gallant said the best player on the ice for Florida in that win was Jaromir Jagr? Yeah, was one or all three of those part of your September predictions for a club that finished with the second-worst points total in the NHL last year? The crazy ride gets crazier in Boston in what will again be “the biggest game of the year” and another “Game 7,” but for just a moment, let’s look at what the 43-year-old Jagr has done in 14 games with Florida and how he figures in to future plans in South Florida. First, let’s go back to the afternoon of Feb. 26. I learned of the Jagr deal, with Florida sending back second- and third-round picks to the Devils, by text. While leaving Starbucks, my phone simply popped up with “Jagr to Panthers.” That was it. No details, no terms, not even the other side of the deal with what New Jersey was getting. It was a venti java-spewing moment, but fortunately I hadn’t started the consumption process. The fallout of the Jagr trade orchestrated by Florida GM Dale Tallon may be the other memorable moment from that day. Hockey pundits and web sites had their instant analyses ready for rollout, and most viewed the Jagr acquisition as pure desperation by Florida, who was trailing Boston in the wildcard hunt by two points. As a letter grade, many doled out the Panthers a Bart Simpson-like “D” rating, while some called Jagr a borderline retired player who would just fade away into the South Florida sunset like most Floridians past their prime. By most, the trade was a stinker. Fourteen games later, those same naysayers are writing different stories. Jagr has 12 points (4-8) in those games. The Panthers have been in the thick of every one of them, and easily could have beaten the Stars, Rangers, Canadiens and Lightning with a bounce here or there. Florida has made its share of mistakes but has played with or clearly outplayed most clubs during the brief Jagr Era in Sunrise. Which brings us to this: How brief will that era be? Tallon caught plenty of flak for the Dave Bolland signing, much of it is warranted. Now, talks between the Panthers and Jagr’s camp have begun. A potential Jagr deal is Dale’s do-over, a mulligan the golfing Tallon would enjoy swinging at in light of the Bolland criticism. However, the reality is that Jagr, a UFA who is making $3.5 million this season, can just walk after these next two weeks. But I don’t think that happens. I’ve arrived early to the BB&T Center press box a couple of times the last month, looked through binoculars and watched a lone Panther get on the ice and skate around, working his way through pre-game preparation. Each time it has been the grizzled, gray-stubbled Jagr. Now that the love affair with the Hamburglar has cooled as Ottawa goalie Andrew Hammond has come back to earth after an incredible run, Jagr’s resurgence and Florida’s last-ditch run at a wildcard berth may be the best story in hockey. Jagr scoring two goals only added to the narrative on Sunday in Canada’s capital. Both were pure goal scorer’s markers – the first a clever shot on the short side against the play’s flow after cutting back against Sens defenseman Mark Methot, the other an incredible wraparound that left ex-Cat Craig Anderson way out of position and the Senators blue line helpless. The latter goal was the kind that happens to the Cats, not the type they net. With every clang of the crossbar and potential goal that has rolled off a stick in front of a gaping net, Florida fans have clamored louder and repeatedly for a legit finisher to join the Panthers. Well, he’s here. Jagr, now with 720 career goals, is obviously not the player he was 10 years ago, but he’s also obviously more worthy of the minutes he’s getting with Florida than he did with New Jersey. His points pace would be 70 for a season, and let’s not forget that Nick Bjugstad topped the Panthers last season with an NHL team record-low 38 points. Jagr’s line consisting of center left winger Jonathan Huberdeau and center Aleksander Barkov has produced 13 goals and 25 assists since 68 has arrived. The top line is the centerpiece of a promising young team that many view as a Cup contender for years to come. Tallon needs to make sure that Jagr is here for that. Monday’s suspension of Florida defenseman Dmitry Kulikov was warranted. It’s the kind of dangerous hit the NHL is trying to get away from and put in its past like the era without visors and immovable steel goals that were anchored into the ice. But don’t kid yourself into thinking there isn’t another name than had an impact on Kulikov receiving a 4-game suspension without pay. And that name? If Kulikov’s blow below the waist would have been to the leg of Shawn Horcoff or Travis Moen or almost any other Dallas Star, there’s no way Kulikov would have been hit as hard and received the punishment he did. But Kulikov hit the Stars’ star. Seguin, a 29-goal scorer and an exciting point per game player, is one of the league’s stars, and let’s face it, the NHL protects its big names. Kulikov, who has no history of dirty play, was also a bit of a victim of the media on the night after the hit. During intermission of Saturday night’s Toronto-Montreal tilt, the majority of the Sportsnet crew chose to vilify Kulikov, whose rebound from last year’s terrible play on the back end is one of the Panthers’ best stories this season. His presence was missed in the St. Louis game, though the performance by call-up Shane O’Brien, a steady Alex Petrovic and an increasingly impressive Steve Kampfer became better after a sketchy first period against the physical Blues. I suggested Sunday night that the Russian defenseman would get five games, then maybe get a game or two reduction. My reasoning for it being as harsh was this: Seguin, the Sportsnet team’s over-the-top persecution of Kulikov, Florida’s tenuous relationship with the NHL’s Department of Player Safety, and, well, Seguin. And Seguin. But here are some names of players who were scofflaws when it came to dishing out hits that were clearly over-the-line against Cats yet received no suspensions: Anton Volchenkov, Jaroslav Spacek, Mike Richards, Radko Gudas, Rick Nash and Keith Yandle. Surely there are some offenders I’m leaving out. Kulikov deserved a suspension because the NHL is trying to put that type of dangerous play in the past, like the hit by Brad Marchand on Sami Salo – very similar contact. It’s unfortunate what happened to Seguin, which hurts the Stars’ playoff hopes. The NHL, though, carried the punishment a couple of games too far. GOING WITH YOUR GUT: Florida coach Gerard Gallant has made it known he plays a hunch at times and goes with a gut feeling, but his Sunday shootout decisions have left many puzzled, myself included. If you want to find the origin of the recent stretch of misery, look no further than the game against the Nashville Predators. The talk after the game was, hey, playoff teams don’t blow 2-goal leads in the third period at home and make matters worse by losing in the shootout. However, that’s exactly what Florida did. But what was perplexing was not so much Gallant’s decision to trot out the four shooters he did – Brandon Pirri, Brad Boyes, Nick Bjugstad and Dave Bolland – but the three sharpshooters he didn’t use at all. That would be Jonathan Huberdeau, Aleksander Barkov and Jussi Jokinen. You can make a case for the first three of Pirri, Boyes and Bjugstad, but not Bolland over Huby, Barky or Jussi. Ever. In the 5-round shootout against St. Louis, he failed to call on No. 16 to go out there and win it. Instead he slipped in Jimmy Hayes, a brutish net-front presence who isn’t exactly Phil Kessel-like in his one-on-one skills. Shootouts are about dazzling dangles and dipsy-do. That’s not Hayes’ game. Barkov, who beat Pittsburgh with perhaps the shootout goal of the year, must be wondering what he has to do to crack the top five in future shootouts. Every Florida 5-rounder should have some combination of Huberdeau, Bjugstad, Boyes, Barkov and Jokinen starting it. WATCH OUT BELOW: Florida’s focus since the turn of the year has been the Boston Bruins, New York Rangers and Washington Capitals, who linger above the playoff cut line. However, the club just below the Panthers – the Philadelphia Flyers — have made a serious push and trail Florida by just two points with the Cats having a game in hand. Philly (24-22-10) has transformed from sellers to potential buyers as the deadline approaches, buoyed mainly by their current 7-1-3 run. The Flyers open a 3-game home stretch with Columbus tonight then Buffalo on Thursday, so they could put even more pressure on Florida. As for the Panthers (24-19-12), tonight’s game against a wreck of a Toronto team is not a must win, it’s a must-must win. Very musty. Double musty. The Maple Leafs (23-29-5) have been in a disastrous freefall since the Panthers’ 6-4 victory spurred by a 4-goal third period on Dec. 28, and we’re currently in Day 3 of the Leaf Rebuild that has already seen Cody Franson and Mike Santorelli leave Leaf Nation. Tonight Toronto will play fast as they did in Sunrise, has ex-Cat Olli Jokinen on the roster and called up prospect Brandon Kozun from the the AHL Marlies. But the Leafs are damaged goods at this point, and anything less than two points tonight will be a huge letdown and leave the #OneUnderTheSun crowd quite upset – which they should be. Florida blew extra points against Nashville and St. Louis and really wasted strong goaltending efforts in their last three contests against Minnesota, Dallas and St. Louis, coming away with just one point. 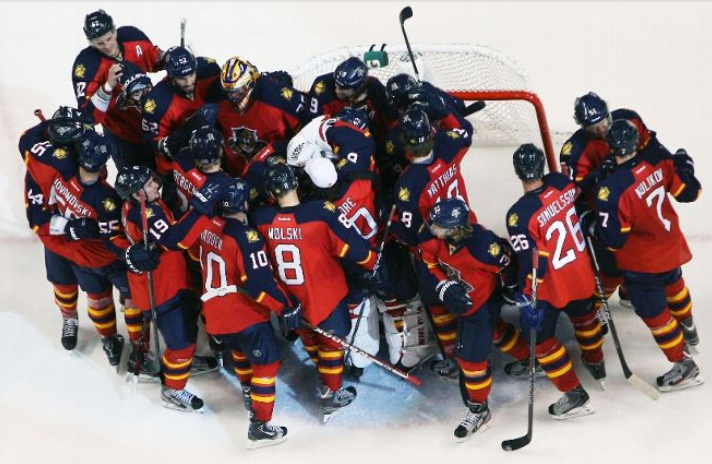 Yet as Cats’ broadcaster Steve Goldstein said post-game on Sunday, we’re talking the possibility of Florida Panthers playoff hockey as the trade deadline nears. Florida looks now more like buyers instead of sellers, and fans are studying the standings, out-of-town scoreboard and upcoming schedules as if they were cramming for finals. No one saw that one coming in September.